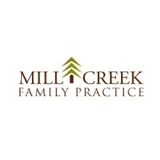 Mill Creek Family Practice (Mill Creek) - Book Appointment Online! Our vision at Mill Creek Family Practice is to provide you and your family easy access to health care. Whether it is for an acute illness or for preventive services, we are here when you need us--including evenings and weekends. Since 1983, we have offered a high standard of personal health care to area families young and old. We provide comprehensive care to newborns, teens, adults, and seniors. Whether you have been with us for five years or five days, our goal is to be your personal health care resource.